Who said that polenta only needs to be eaten in savory dishes? I was so excited about this dessert, that I have been thinking about it for days. Let’s also enjoy the peaches while they last, soon they’ll no longer be available. I cannot believe it’s already September. In France, we have some semolina based desserts like this one (gâteau à la semoule) that the kids usually love (well adults too). So I somehow decided to play with polenta. You need a medium to fine grind. I don’t like to use the coarse kind that much. This polenta has such a fragrant vanilla and milky flavor, I could not stop eating it from the pot. 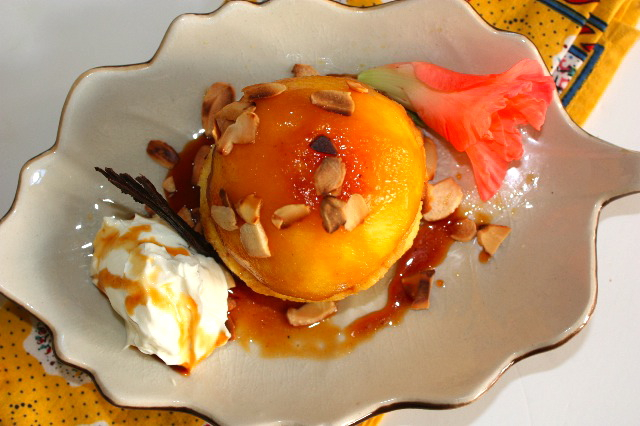 The peach is roasted in honey and rum, which makes every bits a real delight. If you combine on your spoon some polenta cake, peach, mascarpone and run sauce, you might end up being addicted to it. The peaches need to be ripe but still firm so they don’t overcook quickly while in the oven. While I was playing with my dessert, I got caught on the phone for a short time, I did not realized that someone was stealing my crumbs. My dog Enzo is as obsessed with food as I am. Of course, a dog being a dog, his obsessions limit themselves too eating food rather than preparing it. I think if I were a dog, I would be just like him. While distracted on the phone, I did not see Enzo, open the kitchen cabinet, and steel the breadcrumbs jar. He opened the lid, left the lid laying on the kitchen floor, took the bread crumbs jar in “his room”, spreading the crumbs on the rug before eating them, and of destroying the jar in pieces. Then after his fight with the crumbs, he hid underneath the bed to hide, knowing he was in trouble. 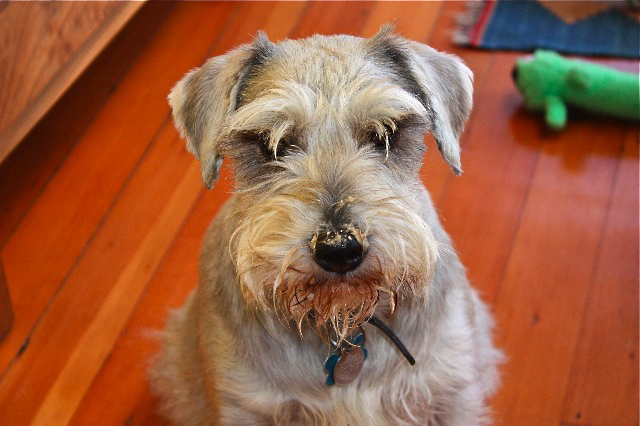 When I saw his moustache I could not stop laughing, schnauzers have funky moustaches that get easily dirty. In a pot, combine milk and cream, sugar and vanilla bean. Bring to a boil. Add polenta gradually while stirring. Keep stirring for about 20 minutes (you can also use express polenta). Add extra milk if the polenta gets too thick. Add raisins and apricots pieces. Mix well. Spread in a flat surface keeping the thickness to about 2 cm. Let it cool. Using cookie cutters, or rinds, cut 4 circles. Grease a baking dish with butter. Place peaches halves (flat part down). sprinkle with sugar and honey and cook in a pre-heated oven at 400F for about 15 minutes, then turn the peaches on the other side. Let them cook for another 10 minutes, then deglaze with rum (the soaking rum). Put peaches back in the oven for 5 minutes. Remove from the oven let them cool a little. Place one polenta cake in a plate. Add half peach on top. Add mascarpone on the side and sprinkle with rum sauce. This entry was posted by silvia on September 3, 2010 at 5:50 am, and is filed under Desserts. Follow any responses to this post through RSS 2.0.You can leave a response or trackback from your own site. a perfect way to use polenta, in a sweet dessert! i like how you left the peaches in halves instead of many little wedges; it looks more sophisticated and flavorful only halved. haha, poor Enzo! my dog also thinks more with her stomach than her head when i cook, but i always laugh since i’m happy she likes my cooking. OMG OMG, your doggie looks so adorable! My younger brother has one too but darker in colour. Haha… He sounded just like mine beagle too. They will stay really quiet when they found out they’re in trouble! haha… They’re such genius. In most of the situation, I would just laugh instead of getting angry with them, you know what I mean! hahaha…. Well, I guess it’s another fabulous inpiring work here. Love what you did to the peach & the polenta cake. Simply divine. Thanks for making my day much easier. Enjoy your day too. how adorable, now here is a friend who knows good food when he sees it just precious, cant hardly blame him with a dessert that is hard to resist! Ce chien est trop mignon! Vraiment ce gâteau est tout à fait dans mes goûts et la présentation est vraiment superbe! I’ve never tried polenta in a dessert, but this inspired recipe is surely a winner, Silvia! That is one of the cutest photos I’ve seen on the blogosphere. What a perfect photo of Enzo. I think between the both of us we are going to introduce people to a whole new world of using savory ingredients in desserts. Brilliant polenta use. Brilliant. I love the polenta with cream, vanilla, apricots and raisins. The roasted peach takes it the a higher division. I would so enjoy trying this! Nice recipe and the cutest dog. Beautiful pics! very creative ,silvia,your sweet polenta,looks great and flavorfull!but you dear enzo is unique,a very cute photo with him ! Your pictures and recipes always inspire, but your Enzo story and picture cracked me up! Happy weekend! You have every reason to be excited about this. Not only does this look stunning, but it is incredibly creative and I’m sure even more delicious. I have never thought of using polenta in dessert either, but after seeing this post…I feel like I’ve been missing out! You have my mouth watering, and I’m tempted to run and make it for breakfast. I have never made sweet polenta before, but now I’m inspired to do it. Thanks for sharing the recipe… and your dog is so cute! I’m excited about desserts that include savory components since I’ve never had much of a sweet tooth. Brilliant marrying of flavors and a perfect transition from summer to fall! 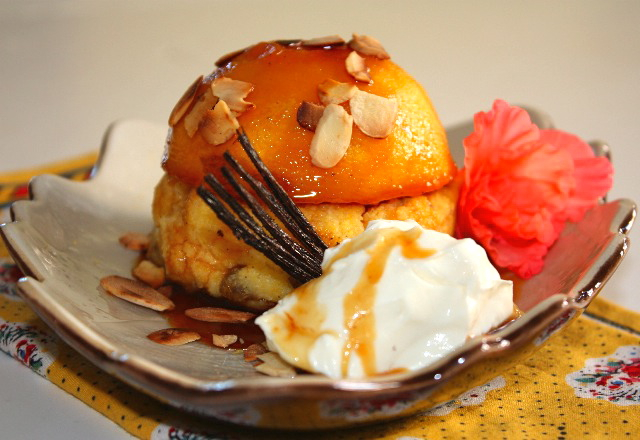 what an amazing looking dessert, I love polenta cake and as for peaches! !….Enzo is just adorable, I’d bet that Patsy would really like him..as for me, I’d take the cake any old day! I thought it was ice cream initially! Enzo is SO cute!!!! He totally looks like he knows he’s in trouble. Having animals in the house means that something crazy is always happening. I have never used polenta in a sweet dish, but it makes total sense when you mention the semolina desserts. Clever, pretty and yummy looking dish, as always! I think if you had left take a phone call leaving me in the room with those lovely peaches and sweet polenta cakes, you would have found me hiding under the bed with Enzo after I devoured them all! what a great dessert! Thanks so much for your creativity and those gorgeous images! Gorgeous idea for polenta and peaches. I sometimes have polenta for breakfast (soft) with a drizzle of honey – I think your rum peaches would make a great addition! Oh and Enzo – way to steal the show! Hi Silvia! I love your use of polenta in a dessert! It makes perfect sense! And the rum roasted peaches are just stunning – such a happy desert! Wow. What a cool dessert. And I do love peaches. Thanks for another great recipe! Wow, that looks beautiful, and what a great way to use up the end of season peaches. We are just starting spring, so have all that beautiful stone fruit ahead in a few months time. Oh Silvia, it looks utterly amazing! Such delicate flavors and wonderful presentation! Enzo is so cute, not a very good thief though! beautiful picture of this enchanting polenta cake – loved the dog – great story! wonderful idea… and not something I’ve ever done… polenta in dessert… well, why not… cornbread is delicious with jam or honey… the peaches would be spectacular with it! Hey Silvia, this looks like it would be the best breakfast. I would love love love some polenta & roasted peach with my morning cup of coffee. Que rico! J’adore la semoule (forcément je suis du Liban!) et ce dessert me parait sublime! La photo de ton chien avec le museau tout plein de jus et de gateau est trop drôle! 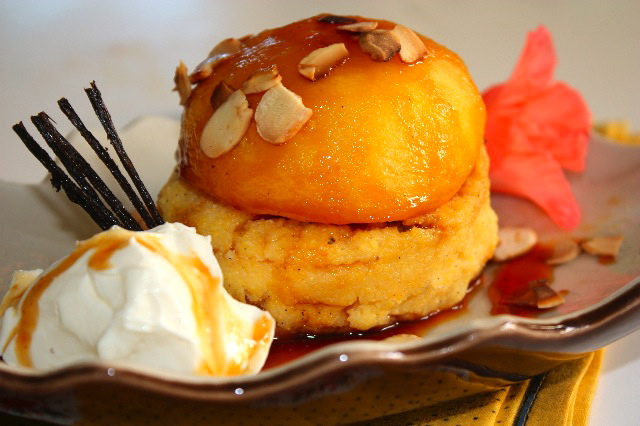 Love the dessert twist with polenta…especially the rum peaches…yum! I love semolina in desserts , so I know I will love this gorgeous polenta creation! But, I am torn between Enzo and the cake So adorable – you make me want to go out and get my own schnauzer! This looks amazing. I have never had polenta in a ‘sweet’ application. Love it. What sort of rum do you use? Also, do you have a favorite rum? I get stuck in the routine of polenta being a savory food too. This sweet recipe looks delicious! Peaches and rum…definitely can’t go wrong with that one. Wow!!! Just take a look at all those photos! The desert is just incredible! I am sure that everyone feels mouth watering when watching those. I will definitely try to cook this myself!